Have you met our new neighbors on the curve? An industrious family of beavers has built a dam and lodge in the wetlands on the south side of Tudor Road at the Tudor-Muldoon curve. They cleared the view to build their dam and home at the edge of Far North Bicentennial Park. They are more visibly active around sunset. 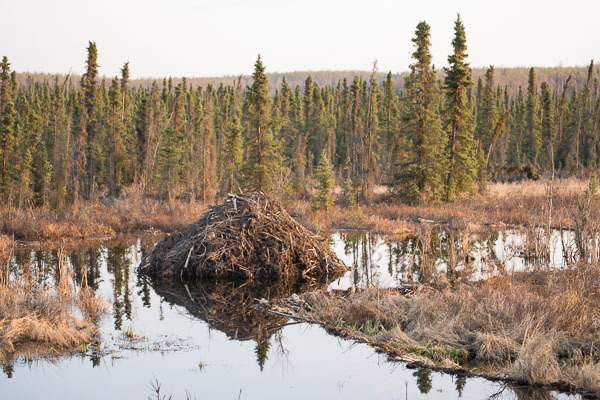 Beaver dam and lodge in wetlands just south of the Tudor-Muldoon curve. Beaver pauses for a snack beside lodge (lower middle, at water level), Tudor-Muldoon curve. Volunteers rescued about 40 irises from the Pioneer Drive median garden May 17. Anemones and American flags adorned the median on Memorial Day. Construction crews took a day off from upgrading the street with curbs and gutters and safer parking for Chugach Foothills Park. Some irises will go to other parks. Trevor Cole, Lucamaria Casagrande, Gwen Crawford; in back, Michele Pamer, Brian, Jim & Ruth Durr rescuing irises, Pioneer Drive. Brian & Jim Durr load irises for transport. Brian, an Eagle Scout candidate, also has a project in Little Dipper Park. Ruth Durr, Trevor Cole, Lucamaria Casagrande dig irises; Jim Durr & Gwen Crawford work in background. Lucamaria is a foreign exchange student. Construction of Pioneer Drive upgrade pauses for Memorial Day with American flags in median, next to Chugach Foothills Park in East Anchorage, Alaska. The park will have have irises and much more (and safer) parking when the project is complete.